Alex Weldon: If ko threats favor Black, I don't see any perfect moves for White, because a doesn't seem to work. The best I can come up with is this. threatens a ko for the corner at , so Black connects there, and connects the White group to safety outside, because and have a monkey jump relationship, and so can't be cut apart. 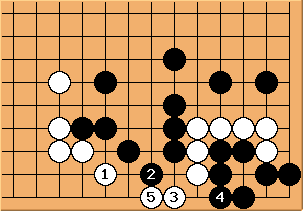 I don't see any way to connect out if White plays at a, but maybe I'm wrong? 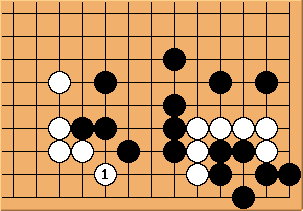 The problem with here is that if Black has better ko threats, he can play somewhere around to prevent connection, and then at starts a ko which Black takes first. Dieter: How about One-two-three here (I know that is not a beginner's concept). Quacki: (Unnerved) No, it isn't! Brent: I think I understand the concept of one-two-three. (maybe.) But what if Black responds to by taking the vital point of ? To my eyes, at least, it looks like this simultaneously prevents a ko for the corner and cuts off the white stones. Am I missing something? 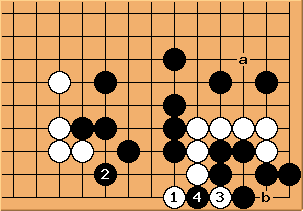 Bill: If Black resists with and , White plays atari with and Black cannot then connect at because of damezumari. Brent: Ohh, I see. 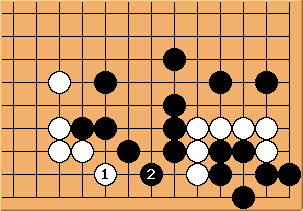 For some reason it had not occurred to me to play (forcing ) before pushing out with . Thanks! unkx80: Please see ko fight. A possible ko threat is a. Bill: Wb is a local threat. Roger: How can white prevent black from splitting the two groups after ? I can't seem to work it out. 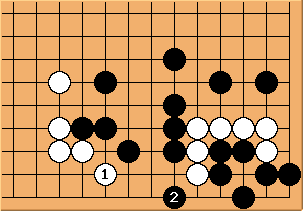 Monkey jump (white gets two moves locally). LukeNine45: threatens to kill the black corner with a ko. makes the corner live, and connects.